only for cancellation after bookining webresint.com or for a no show we will charge to the credit card one night. only full pay for first night would be requested at the booking, this would warrantee the reservation dates non refundable. for groups larger than 20 people are accomodated by four people in each room. one dormitory of 10 and private dobles with shared bathroom. 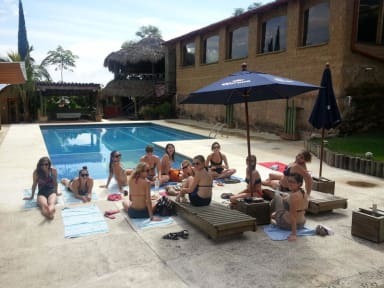 La Villada Inn, a family run hostel operating in the northern part of Oaxaca City, offers rustic adobe (earth brick) cabins, rooms and dormitories in a relaxing environment with spectacular views of the surrounding mountains. Our facilities include a large outdoor swimming pool and patio, and several common areas ideal for eating, drinking, playing pool or fussball, or just chilling out with friends or fellow travelers from around the world. We also operate a private bar, Club Q' Vola, which is open to select locals and all of our hostel residents most Fridays and Saturdays. Beds range from individual to king size, and linen and towels are provided. Rooms are cleaned daily (unless we are instructed otherwise). There is hot water 24 hours a day. Although there are no cooking facilities, our spacious cafeteria, which is open from 8 am to 8 pm, offers not only more breathtaking views, but also a variety of big breakfasts (only US$3.50) and a lunch and dinner menu that includes such Mexican delicacies as entomatadas, enfrijoladas, tasajo, pozole, tamales, tortas, tacos, pan dulce, chapulines, and guacamole (all at very reasonable prices). On special occasions we offer even fancier Mexican fare (again at very reasonable prices). Atmosphere: Public areas for relaxing and making new friends not only locals but also from around the world. We have a large swimming pool to refresh after long journies. Private rooms and dormitories: Ecological construction using Adobe (earth blocks) and rustic environment. Beds are kings, queens and individuals sizes with sheets, blancket, pillow and towel. Bathrooms; clean!!! and 24 hrs hot water. Location: Within walking distances to bus stops, taking you to the finest museums,galleries, parks, cultural centers, bars, restaurants, hangcrafts and food markets only in 15 minutes in a car/bus or 40 minutes walk. Cafeteria: We have food available from 8am to 8 pm. Low prices for large breakfast ($3 US dls) different packages. Some scrumptious choices include in our menu: Entomatadas, enfrijoladas, tasajo, pozole, tamales, tortas, tacos, pan dulce, chapulines, guacamole, and more. We also have special days when traditional dishes that are not usually included in the menu, are available, so wait for delicious surprises! ****The room taxes are not included however we do not add the tax to your bill if you do not require it. I stayed at La Villada for two weeks and was very impressed. I had stayed in central Oaxaca for the month before I arrived, and being up in the hills was a very pleasant change. The fresh air and views were lovely, as were Julieta and her family and staff. Everyone was welcoming and very helpful, and the food was great. Getting to the city and surrounding areas was also very easy and affordable. I highly recommend La Villada! We had a wonderful time staying with the family at La Villada. The location was beautiful, up on a hilltop just outside of town (maybe a 10 min cab ride). We stayed in one of the cottages, which was cute and very clean. We were there for day of the dead festivities, and were invited to help build the alter/prep food with the family before going out to celebrate in town. Overall, a great experience and we will definitely be back to oaxaca! Gorgeous hostel with great facilities, including a lovely pool. The family and staff were exceptional, they were all very welcoming and helpful, giving us lots of advice about things to do in Oaxaca. Would happily say here again! I stayed here 2 nights with my boyfriend. It's a bit outside the city but the view is awesome. As is the pool. The family that runs it are really nice and helpful. Unfortunately we got food poisoning from a restaurant and had to spent the next day in bed. At some point one the ladies brought us soup so we'd get better soon. The only downside was there was no one else which is a shame cos this is the perfect hostel to just chill and hangout by the pool. There's also cold beer in the fridge. Great place to stay for a little refuge from the city- with a pool! Beautiful view and lovely staff! We were recommended the tour to Mitla and it did not disappoint! Amazing time in La Villada. The view is just amazing. It’s quiet place to stay few days and take relax, chill, read, draw or whatever ! The house is really nice, good design, bed are confortable. The staff were so nice, you can order something on the kitchen and it is really good ! I really recommend to stay in this place. Great Hostel outside of the city. The staff are fantastic and very helpful. Unfortunate a lot of the facilities didn’t seem to be used such as the bar and there isn’t really a receptions desk. But would recommend it to anyone visiting Oaxaca. Staff were lovely, location the only downside - a taxi to town is the only way 60 pesos each direction. Weren't many people there when we stayed but those who were there were great! Nice room with good view over the city. Nice view from the mountain. This does mean you must always take a taxi. The biggest plus was the family who runs the place. Very warm and accommodating. Some major downsides were rude kitchen staff and incessant neighbours' dog barking during every night which woke us up many times. Also good to know is that the bar is actually closed. When we were there there was very little socialising. But all in all, we were pretty happy.